Shellacked in Great Winter Hunt colours and topped with a seasonal star makes for one remarkable ACRONYM! 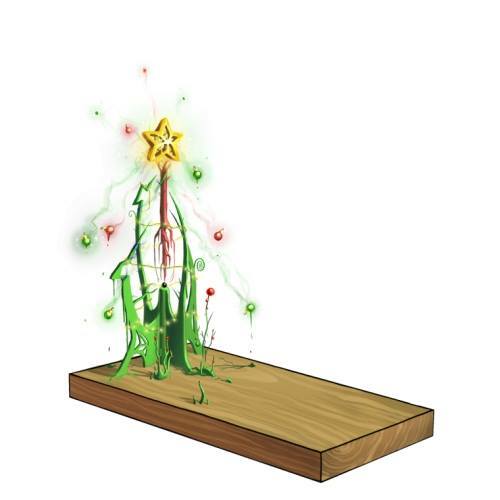 Resonating with the spirit of the season has caused a seasonal twist in its abilities. Now acting as a type of amplifying rod for everything merry, it has started to spontaneously cause wild mistletoe growth and rampant ornament showers. Place one near your tree to make decorating for the season a snap! The Festive ACRONYM Skin can be used on Arcane Capturing Rod Of Never Yielding Mystery. The trap's stats (power, power bonus, attraction bonus, etc.) are not changed. The Festive ACRONYM Skin may be made available during the annual Great Winter Hunt event and can be traded on the Marketplace or through Give To Friends. 10 December 2013: The Festive ACRONYM Skin was released at the start of the Great Winter Snowball Fight event. This page was last edited on 9 December 2017, at 11:35.